Consumer Beware: Cheap Chinese piercing kits on Ebay and Amazon! In an effort to inform our readers of the inherent dangers and huge differences in body art supplies and body piercing kits available today, we strive to keep up to date on the good, the bad and the ugly when it comes to body art suppliers. The above photo is for a kit that is currently being hocked on ebay for $60 plus shipping, and without really looking at what is included it might seem appealing. Upon further inspection it is obvious that this is nothing more than a cheap Chinese ear piercing kit with a couple forceps and a dozen or so needles thrown into it! 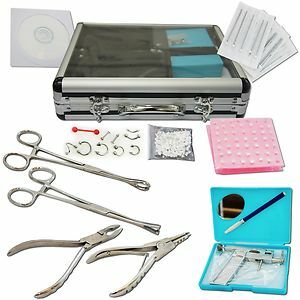 We ask you to compare this kit (that includes needles and jewelry for only 10 body piercings) with a comparably priced actual body piercing kit assembled and produced in the USA by clicking here on this link for starter body piercing kits. If you take the time to read the actual contents of what is offered you will find they are vastly different. Make sure you ALWAYS look at the details of what, who and where your supplies are coming from and make sure you are making a choice you and your customers can live with! « Do You Have What It Takes To Be A Body Piercer?